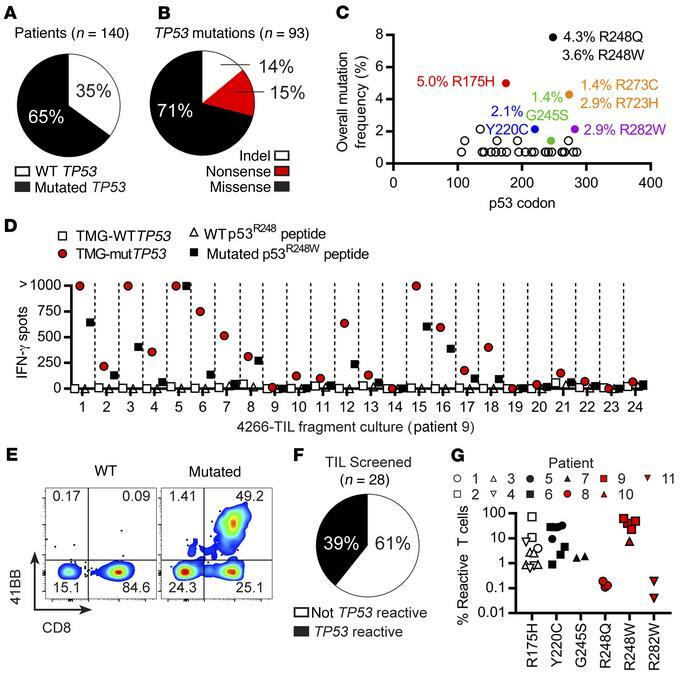 TP53 hot spot mutations are immunogenic and elicit intratumoral T cell responses to p53 neoantigens. (A) Patients with a tumor expressing a TP53 mutation. (B) Classification of TP53 mutations from resected tumors. (C) The overall frequencies of each missense mutation in TP53 from all patients sequenced by p53 codon where the specific amino acid change frequency is given for selected mutations. (D) Screening results from patient 9 as measured by IFN-γ ELISPOT. (E) Expression of 41BB from patient 9’s TIL culture 1 in response to TP53 TMGs. (F) Overall frequency of TIL responses to mutated TP53, which include TMG, peptide, or both (Supplemental Table 5). (G) Frequencies of verified positive TIL responses from selected fragment cultures (some patients had >1) to p53 R175H, Y220C, G245S, R248Q, R248W, and R282W neoantigens. The upregulation of 41BB minus the background in response to mutated p53 peptide (CD4) or TMG (CD8) is reported. Types of T cell responses can be found in Table 1.